Smile.io offers online merchants a points and rewards app for e-commerce sites. Nowadays, online retailers can choose from a range of sophisticated e-commerce technologies to drive their business. However, adding a loyalty component to their offering can be difficult and expensive. Back in 2010, a few undergrad friends from Waterloo, Ontario formed a company that implemented e-commerce solutions for merchants. Many of their merchants were having issues getting consumers to make repeat purchases. They often requested a loyalty mechanism for their store that could be customized to fit their brand and offering. The young company saw an opportunity to create a simple, yet powerful, points-based loyalty service that could plug into existing e-commerce technologies. Thus, the company pivoted to build Smile.io, a points and rewards module for e-commerce stores. Smile.io allows brands to create white-labeled, point-based loyalty programs that they can configure and self-manage. The Smile.io team launched the first version of their product on Amazon Web Services. As the founders didn’t have a lot of operations experience, they needed to hire DevOps staff to configure and manage their new infrastructure. However, AWS proved too difficult to configure in a modern way to meet the needs of their app. Next, Smile.io hired an operations-as-a-service company to manage their infrastructure. This freed up the team to focus on their strengths—developing and improving their product. This approach worked well for a while, however, as the company matured, they started deploying weekly, and sometimes daily. As such, their team needed more visibility and control over their apps on production. Working with an external company meant lengthy turnaround times and several back and forth emails, which made development excruciatingly slow. Smile.io’s CTO, Bill Curtis, had previous personal experience using the Heroku platform for side projects and hackathons. The platform offered the stability and scalability that the business needed to grow, and it offered the flexibility and fine-tuned control that the engineers needed to accelerate development. 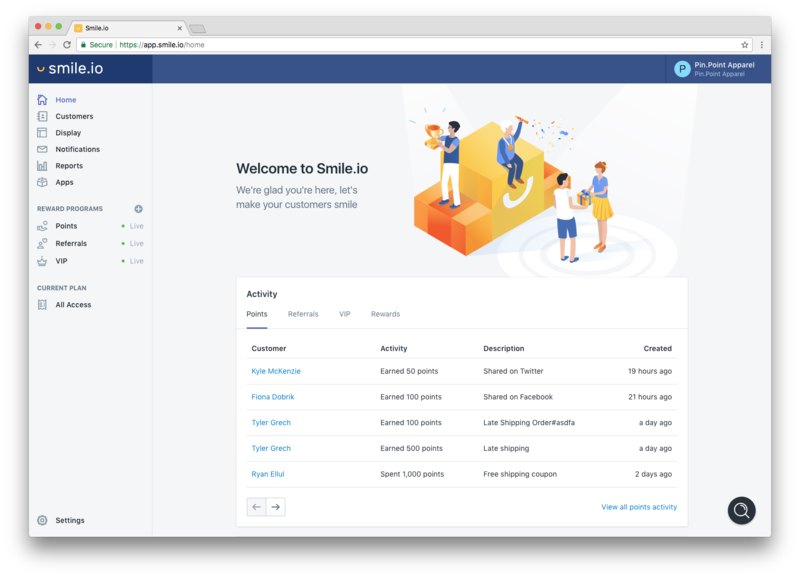 Smile.io transitioned their entire stack onto Heroku, including their Rails API and Ember.js front-end app. They migrated their database from MySQL to Heroku Postgres, and the team was especially happy with Postgres’ automatic backups and forking/following capabilities. The development team used an array of Heroku Add-ons, including Deploy Hooks, Librato, Rollbar, Heroku Redis, and SSL encryption. The ability to add such services with a simple click has been a huge time-saver for the team. In the past, if they needed to integrate a logging system or error tracker, they’d have to plan it into their sprint cycles and deal with any complexities that arose from adding third-party technologies to their code. With Heroku, they can opt-in with the click of a button, or try different services to see which they like best. In the six months that Smile.io has been on Heroku, the engineering team has already been able to move faster. 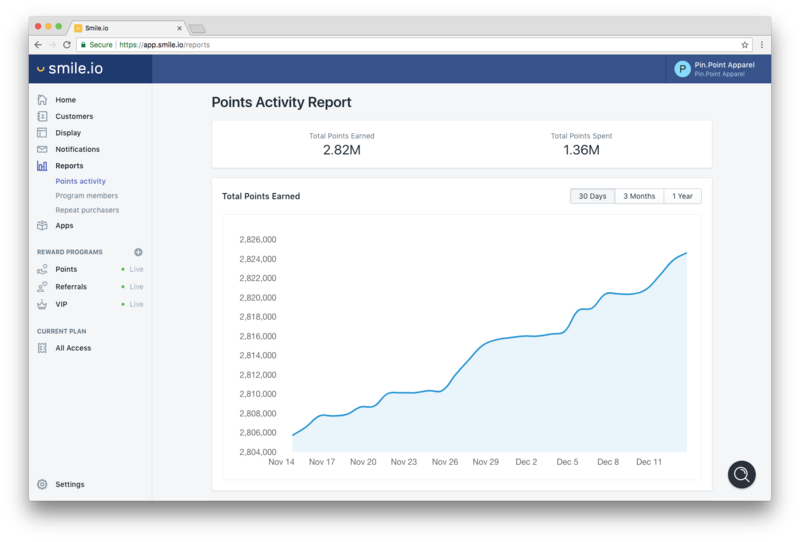 They now have total visibility into how their app is running, which gives them the flexibility and confidence they need to deploy changes every day. They can easily scale during peak traffic, such as on Black Friday and Cyber Monday, while ensuring their system is stable—all without worrying about technical overhead. Ultimately, Heroku has enabled Smile.io to ship better product faster and more reliably. The development team can focus on evolving their product and fulfilling their core purpose—helping merchants retain happy customers. Are you building an e-commerce enabling app? After moving to Heroku, the Smile.io team has been able to accelerate development and easily scale to handle traffic spikes. For more information, contact Heroku today. Read our Developer Interview with Bill Curtis, to learn more about Smile.io’s stack, architecture, and development experience. Smile.io (formerly Sweet Tooth) is a points and rewards app for e-commerce stores. Smile.io allows brands to create white-labeled, point-based loyalty programs that substantially increase customer retention and sales. These loyalty programs drive results by increasing customer purchase frequency, customer lifetime value, and by lowering customer acquisition costs. For more information, visit smile.io.